Whisk the egg whites until stiff. Add the caster sugar and whisk for 1 minute. In another bowl whisk cream, until just firm. Beat the egg yolks and add to the whites, fold into the cream and Zespri SunGold kiwifruit pulp. Add the lime juice. 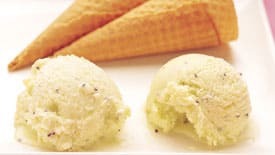 Put mixture into ice cream machine, or place into freezer and every 1 – 2 hours until frozen whip the mixture until it feels firm to the touch.